Ok you guys, this is my first ever give away so get ready. I've never done one of these before because nothing prior had felt like a good fit. But I have to say, I am very excited to introduce Favery to you (or perhaps you already know of it): they make some pretty cool stuff, have a big handful of amazing designers supplying them with the utmost covetable pieces. Lucky for you, i've got an extra one to donate... See how to enter at the end of the post. 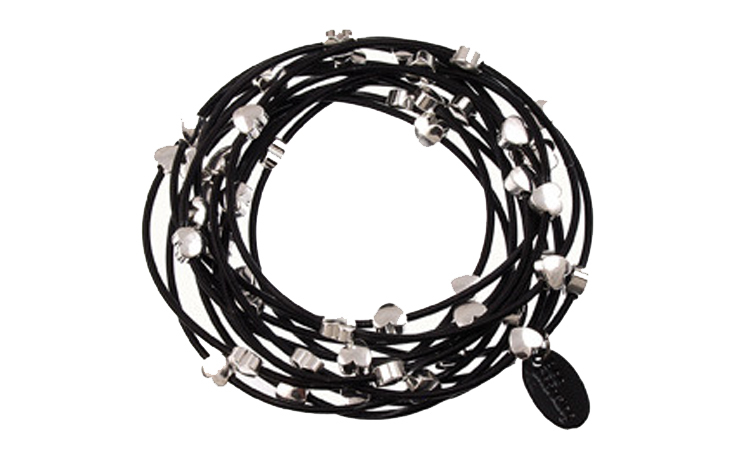 The piece is a bracelet made of multiple black piano wires adorned with petite silver stars. The way they just intertwine and bunch up is kind of messy and cool, which i thought matched my personal style perfectly. It feels totally rock 'n roll. So i decided I'd show you a couple of ways to wear it, or how I wear it anyway, you know, for demonstration purposes. But to explain it better, i made a video... feast your eyes! Now here's how to enter (it's easy as pie) -- first, ask yourself: do you like amazing jewelry & accessories? Do you live in the US? Yes? Yes? Great. *To be noted: the bracelet above has hearts but the one i have (aka the one you'll get) has little stars instead. CLICK HERE to get to Favery and sign up for an account. That is all! No likes, no follows, just pure jewelry joy. Just make sure you use that specific link or else you won't be entered! Retail value is $55. Hello! Love the looks! Great job putting affordable and accessible brands together for a fashionable look. GIRLFRIEND!!!!!! Your video editing skills are BANANAS!!!!!!!!!!!!!!!!!!! love the music and the total montage! Fine piece of video editing. What model Guess pumps are those? I love the way that the cup where your heel goes extends a little high for a different spin on the classic black pump. I want them. Tell me if you can and thanks in advance!